Brands come and go, but blame it on luck or sheer marketing smarts, some names have stood the test of time. Today, most folks who frequent grocery or sari-sari stores refer to toothpaste as simply Colgate and a sachet of coffee as Nescafe. These products usually enjoy a huge market share, and consumers are not complaining. The same goes for some of the most well-loved Filipino brands. We drizzle our halo-halo with our favorite Alaska evaporated milk, enjoy drinking parties with Ginebra San Miguel, and prepare our traditional adobo with a spoonful of Datu Puti vinegar. What’s in a name? Armed with only a high school diploma, NBS founder Nanay Coring first worked as a salesgirl for a bookstore owned by her brother and sister-in-law. The said store was located on the ground floor of Panciteria Nacional in Escolta, a place where the name of the 71-year old retail giant supposedly got its name. Or so we were told. 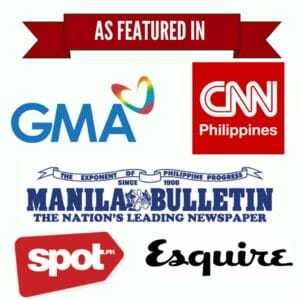 In a Philippine Star article, Nanay Coring revealed that the name of the store came from an unlikely source. 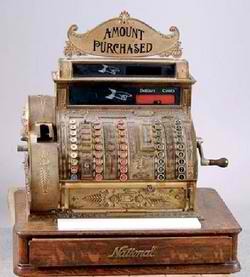 Turns out, the National Book Store that we all love was actually inspired by a brand of a cash register, and Nanay Coring decided to use it because “it sounded like a good name”. Bonus trivia: During World War II, Nanay Coring almost renamed her store “National Slipper Store.” At that time, she and her late husband, Jose, hid American books (which the Japanese obviously didn’t like) and sold school supplies along with slippers instead. Thanks to Japanese soldiers with tired feet, the affordable slippers ended up as best-sellers. What’s in a name? Contrary to popular belief, Datu Puti vinegar was not based on a legendary chieftain. Yes, there was a certain Datu Puti who, along with 9 other Bornean Datus, allegedly arrived in Iloilo during the pre-colonial era. However, the Reyes family, who founded the popular brand of condiments in the 1970s, said that history or legend has nothing to do with their products. Datu Puti is simply a mash-up of their mother’s surname (“datu”) and the Filipino translation of white (“puti”), which is the primary color of the traditional palm vinegar or sukang paombong. Bonus trivia: In the early 1980s, comedian Pugak (Conrado Piring in real life) became the first celebrity to be featured in Datu Puti‘s highly successful Mukhasim (“sour face”) campaign. What’s in a name? Max’s Restaurant was named after Maximo Gimenez who, being an alumnus of Stanford University, had befriended American GIs after World War II. Since the military camp was close to his residence at that time, Maximo gladly welcomed American soldiers as drinking buddies. They soon looked for something to eat so Maximo’s niece, Ruby Trota, concocted a fried chicken recipe that started it all. The combination of fried chicken and hard drinks eventually gave way to a full-blown business. 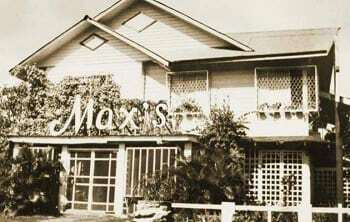 First referred to as “Max’s Bar,” the store would’ve been named ‘Maximo’ but since the Americans had a hard time pronouncing it, the owners preferred to use the shorter version. Bonus trivia: After the war, Max’s closed down for a year since their loyal customers (i.e. the American soldiers) already left the country. But thanks to “word of mouth” marketing, the first store in Scout Tuason, Quezon City soon reopened. The rest, as they say, is fried chicken history. What’s in a name? As its logo suggests, Ginebra San Miguel, the oldest brand of gin in the country, was named after St. Michael. But unknown to many, the iconic painting showing an angel triumphing over the devil has an interesting trivia to tell. At the age of 25, renowned Filipino painter Fernando Amorsolo was commissioned by the company to create the logo, which is now popularly known as Marca Demonio. Impressed by his work, owner Don Enrique Zobel offered Amorsolo an opportunity to study at the Academia de San Fernando in Madrid with a nice stipend for him and his family. Bonus trivia: Ginebra San Miguel was served during the 1898 Malolos Convention. It also gave way for Fernando Amorsolo to further his education. After evaluating the result of his entrance exam, the Academia in Madrid informed Amorsolo that they would gladly accept him not as a student but, you guessed it, as a professor at the school! What’s in a name? First manufactured in the Philippines in 1972 through Holland Milk Products, Inc. (HOMPI), Alaska milk wouldn’t be as popular without the iconic “Alaska boy” on it’s label. Several stories have surfaced over the years regarding the origin of this cute white boy with blond hair. Some say it was inspired by a real Alaskan kid while others believe it was actually Michael Uytengsu, son of the late AMC Chairman Wilfred Uytengsu. But according to the company’s official statement, the Alaska boy on the label was just an artist’s rendition. In other words, the smiling boy depicted in Alaska milk cans is just a fictional character. I used datu puti brand for my menu’s and it turned out awesome! 🙂 D’ best quality brand ever! Datu Puti is the Best brand!!! iloveit…..
Datu Puti lamang ang makakagawa ng mukhasim-sarap sa panlasa ng mga Pilipino! Datu Puti is the best brand ever. Datu Puti all the way.. love it. The real mukhasim character was not Pugak. I can’t remember his real name but he is still alive and living as a caretaker of Ed Reyes’ islands in Coron. I really love Datu Puti Suka forever and ever!!! I am loyal consumer of DATU PUTI SUKA! The original logo of National Bookstore even resembled the one used by National Cash Registers. Same white text on a red field, almost same font, and same stylised ‘N’ with a tailed line. The Ten Bornean Datus are still a myth and have no historical evidence.